"An early morning hotel breakfast is not the usual time to encounter lively film students. The first to appear with the typical live - in look was Barbaros Gokdemir, the lone Turkish participant, who informed me that he had found the most useful aspect in the previous three days, had been the lectures. Lectures are harder to come by in developing countries such as Turkey. On the bus journey the magnificent Korda Studios the various advantages of this style of "hands on" Master Classes with lectures and analysis carefully choreographed were to be revealed to me by various scholars and participants." 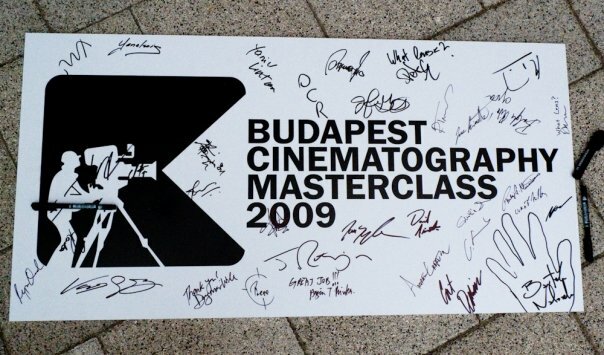 Thank you Nigel Walters for mentioning about me in your article about the Budapest Cinematography Masterclass 2009. It has been quite a long time since the masterclass is over but I just found out about this article and I was very happy. The Masterclass provided me with an invaluable experience of the craft of cinematography, filmmaking, and collaboration. I was able to work with film students from different 16 nationality and a very strong mixture of film schools. To meet and work with film students from UCLA, Nfts, Taik, Lodz, Victorian College of Art, Westminster, FTII and many others put me on the right track in the sense of knowledge and experience and gave me a chance to enhance my skills on cinematography. I believe what I recieved from the masterclass is transferable and marketable in the field and it will help me reach my goals as a filmmaker. Without the masterclass, I don't know if I would have the experience to work with Panavision cameras under the supervision of a great tutor Benjamin Bergery. Working on Korda Studios and understanding how a sound stage really works and how major productions are being done is very crucial. Having lectures and conversations with great cinematographers like Vilmos Zsigmond and Elemer Ragalyi and great tutors like Nik Powell, and having a chance to meet and hear his experiences on film industry from Anthony Dod Mantle was all a part of the masterclass. I miss you Budapest and I am very happy to be a part of the masterclass.